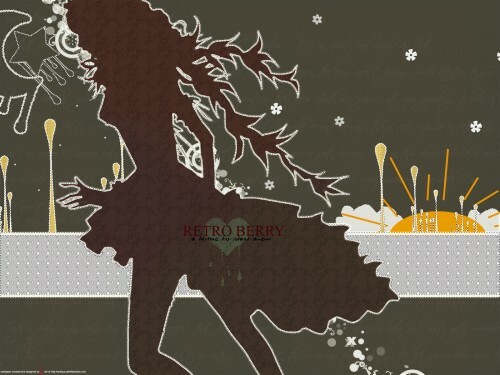 Princess Ai Wallpaper: . RETROberry . Minitokyo »	Princess Ai Wallpapers » Princess Ai Wallpaper: . RETROberry . A version with different text. hmm, the texture looks better at fullview, eh. I like the colors and the vecotring is really neatly done. Nice concept! ^__^ I like the alternative version! I like it! Very cool...and imaginative? lol! Yay! chocoberries! Now THAT is retro! Using just a few colors you made a great work! Ok of all of the walls ive seen from you and the patterns done on your background ive never seen this broken line outline since you only see that in PS only...Beauitfull wall as always Saki your truly are the pwincess of choco berries. I love it, Saki! I really like all the different patterns you used, and I've never really seen dotted lines all that much, at least in anime wallpapers. All in all, with the color selection and the style of the wallpaper, it's great. but still. I love it~ very stylish. The lines coming from the sun seem to really bother me, maybe if they weren't so straight, they would look more like rays ... But that's a minor flaw. The colours are really working well with each other, there's a pop of orange colour here, and then textures are clean and crisp. Nice job, keep up your retroish stuff. SAKIII! i am sooo left out! *hugs* How have you been? Digikb died in the end. you know what's so amazing about this wall, saki? (other than you made it XD)that it looks like it's been sewed on. Oo yeah, like patch work. because of all the patterns, designs, and whatnot. Wow! a different wallie, I like it a lot! Love the creativity! <3 There's very little you can do with her art & this looks pretty gorgeous ; love the legs & dress , of course.